Improve your portrait photography using Carolyn Mendelssohn’s exhibition in our main gallery as your inspiration. Packed with useful tips and tricks. This presentation and workshop will explore what makes a compelling portrait, and give you practical starting points and tips that they can use straight away to develop your own portrait photography. In the practical part of the session Carolyn with be working with you looking at how to use light, and recognizing good light on location. You will look at what lenses and what settings to use, and most importantly how to connect with your subject. Carolyn will guide you on how to take great portraits, as well as giving you an opportunity to take portraits on location around the Brewery Arts Centre. This workshop you with practical examples and exercises that you can use yourself after the workshop. Preferable DSLR Camera, Lenses/prime lenses (if you have them) and a memory card, reflector (if you have one). If you don’t have a DSLR – by all means bring a rangefinder or a point and shoot camera. Carolyn Mendelsohn is an artist who uses photography, film and performance to realize creative ideas rooted within the lives of individuals, their story and location. Alongside this she works on personal photography portrait commissions and commercial briefs, lifestyle and fashion. 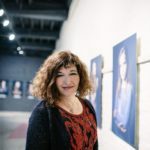 She runs site-specific creative photography workshops, and mentors photographers, as well as enjoying working collaboratively with other artists. Carolyn’s work has been exhibited internationally and has won many awards. She has had work touring with the prestigious Royal Photographic Society International Photography Exhibition; her portrait ‘Alice’ having won the gold medal. In print, her photography has appeared in The Guardian, The Sunday Times, The Telegraph, The Independent, The Mail, La Monde, British Journal of Photography. Her portrait series “Being Inbetween” has been shown in three solo exhibitions and a selection of the work is currently on exhibition in the Gallery. A book of her work is in development with Bluecoat press.